Were Gandhi’s final years his finest? “Gandhi's Gift” shows the Master of Nonviolence at the end of his life, on the brink of attaining his lifelong goal of freedom from the British but with his heart breaking by the partition of India and the terrible communal violence that is killing untold thousands. Having led masses in nonviolent marches, Gandhi now walks alone for unity and peace. “Gandhi's Gift” is the first major documentary about Gandhi made in the U.S. It is filmed on location in India, South Africa and the UK at all of the important sites in Gandhi's life. 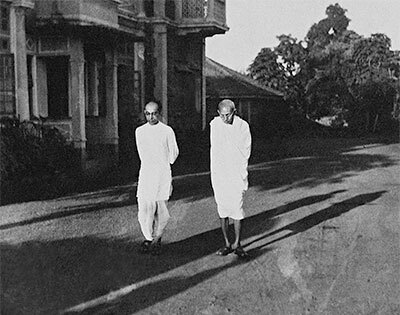 Historians and witnesses who actually grew up in the Mahatma's presence tell his story. Featured commentator, Dr. Rajmohan Gandhi, is both an historian and grandson with vivid memories of his grandfather's final days. Interviews such as his are historic in view of the advanced age of the participants. Other expert commentators are Gandhians Dr. Vandana Shiva and James Douglass. “Gandhi’s Gift” reveals inspiring details about Gandhi’s life that were known only by scholars before now. His timeless story is as timely as ever, introducing audiences to a 21st Century Gandhi with a message of nonviolence and interfaith harmony more important now than even when he walked the Earth.